Displayed below is a picture of the Long Range target that was used by the American and Irish teams competing at the Creedmoor Match in 1874. 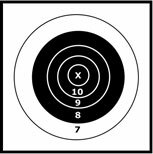 As you can see, it is significantly different than the target we use today. 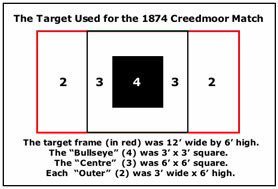 The original Creedmoor target contained square and rectangular scoring areas (2, 3, and 4 points), and was twice as wide (12 feet) as the target in use today.